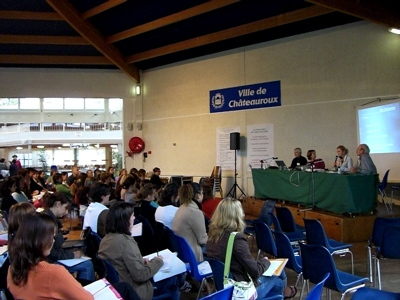 In 2003, the French natio­nal col­lege of gyne­co­lo­gists and obs­te­tri­cians (CNGOF) cal­led for the « Etats géné­raux de la nais­sance » encoun­ter (EGN) brin­ging toge­ther pra­tic­tio­ners, poli­cy makers and consu­mers of mater­ni­ty ser­vices in France. A col­lec­tive of about 20 consu­mer groups was foun­ded whose pur­pose was to sub­mit a plat­form of 40 pro­po­sals for impro­ving per­ina­tal care. Since then, the CIANE col­lec­tive has rea­ched a consi­de­rable size with 135 non‐profit socie­ties repre­sen­ting approxi­ma­te­ly 150,000 citi­zens. During the clo­sure cere­mo­ny of EGN 2003 it had been sug­ges­ted that the next EGN may be orga­ni­sed by consu­mer groups. This chal­len­ging dream became a rea­li­ty : EGN 2006 have been set up off‐ground by CIANE with the help of the « Quelle nais­sance » socie­ty in Châ­teau­roux. More than 350 citi­zens signed up for par­ti­ci­pa­ting and a pan­nel of 44 contri­bu­tors were invi­ted in 20 the­ma­tic work­shops. The par­ti­ci­pa­tion went beyond expec­ta­tion as about 450 per­sons sho­wed up, half of whom had come from pro­fes­sio­nal circles (mid­wives, doc­tors, civil ser­vants of the health care sys­tem) and the other half were stu­dents and parents. On top of this, an Open Space faci­li­ta­ted the emer­gence of inno­va­tive ideas. EGN has been an oppor­tu­ni­ty for CIANE to reflect upon its stra­te­gies and assess its impact on per­ina­tal poli­cies. It is hoped that streng­the­ning its demo­cra­tic basis will gene­rate an increa­sed social mobi­li­sa­tion of all « actors », the­re­by mea­ning consu­mers, pro­vi­ders of mater­ni­ty care, research fel­lows and poli­cy makers. This web­site is now dedi­ca­ted to the publi­ca­tion of reports, com­ments and recor­dings pro­du­ced by EGN 2006. Please start visi­ting our pho­to­graph gal­le­ry to appre­ciate that it was also great fun ! A public dis­cus­sion list exten­ded dis­cus­sions and com­ments till the end of the year, when CIANE came up with a poli­ti­cal agen­da that is cur­rent­ly dis­cus­sed with its part­ners (mid­wives and stu­dents) and sub­mit­ted to can­di­dates for the for­th­co­ming French elec­tion. Atelier 18 - Comment devient-on une maternité Amie des Bébés ?